I think these little carrots are so cute and fun! They are from Lockhart Stamp Company and I bought them from Ellen Hutson. 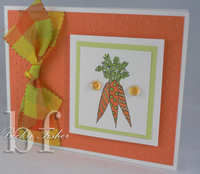 I used my swiss dots Cuttlebug embossing folder on my orange bazzill and layered it over a white card. I colored my carrots with my Copic markers and I also colored the clear bauble from Michael's with my orange Copic marker. The ribbon is from Hobby Lobby. It's a wide wired ribbon but I took the wire out. I really like these colors!